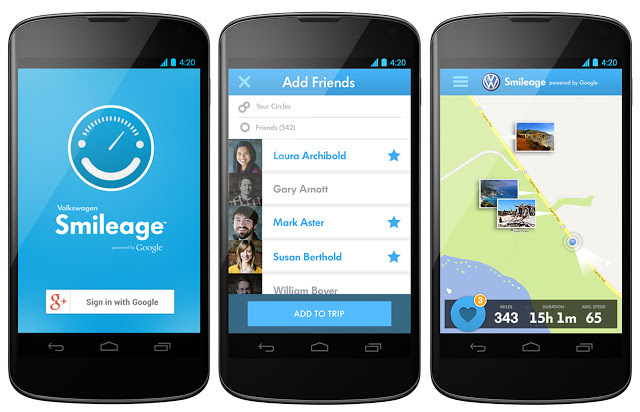 Google has teamed up with Volkswagen to create “Smileage” a trip journal app that allows you to plan and document your next road trip. This is the first of a series of creative experiments that Google has been building since last year. The app, available for Android phones, provides information such as maps, weather and traffic details and allows photos and videos to be uploaded and automatically added to a live interactive map. In addition, the app allows your fellow road trippers to contribute their own pictures to your map. You’ll need a Google+ account (our page on Google+ is here btw) and if you’re interested in getting an early copy of the app, you can signup here.